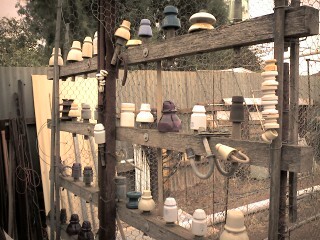 The Ashmans Grandfathers collection of ceramic and glass insulation caps. Most were made in Japanese ceramic factories post war. I love his collection and the way he displays it. Then you should have seen the shed with the glass bottle collection!! The Ashman clan on all sides are the masters of recycling and reducing all landfill as they do not throw away anything and thrive on second hand. Sensational! !